Transparency Market Research (TMR) has published a new report titled, “Bovine-based Collagen for Biomedical Applications Market - Global Industry Analysis, Size, Share, Growth, Trends, and Forecast, 2017–2025”. According to the report, the global bovine-based collagen for biomedical applications market was valued at US$ 550 Mn in 2016 and is projected to expand at a CAGR of 10% from 2017 to 2025. The report suggests that rigorous research and development activities in regenerative medicine & wound healing and increase in commercialization of novel collagen-based drug delivery systems are anticipated to boost the growth of the global bovine-based collagen for biomedical applications market from 2017 to 2025. North America and Europe are expected to dominate the global bovine-based collagen for biomedical applications market in the next few years, owing to increase in preference for minimally invasive technologies, surge in geriatric population, rise in burn and trauma cases, and high preference for bovine collagen as graft substitute. Players are continuously working in the global bovine based collagen for biomedical applications market. They also enter into distribution agreements to fortify their footprints across worldwide. Increase in preference for minimally invasive technologies is expected to drive the global bovine-based collagen for biomedical application market during the forecast period. In June 2017, Taxus Cardium received a patent protection on the application of Excellagen in tissue regeneration and wound repair. In March 2015, botiss biomaterials GmbH launched three innovative products - maxgraft cortico, collacone, and an enhanced version of mucoderm. The report offers detailed segmentation of the global bovine-based collagen for biomedical applications market. Based on application, the bone graft substitutes segment is likely to account for the largest market share by 2025. This is attributed to increase in global geriatric population, significant rise in trauma and burn cases, surge in trend of bone graft substitute, and high preference for collagen as a bone substitute due to its osteoinductive activity. The hemostats segment is anticipated to expand at a high CAGR due to increase in usage of collagen-based hemostat products to prevent bleeding. Moreover, technological advancements in collagen-based hemostat products are likely to propel the segment. In addition, the collagen based scaffolds segment will likely to project by a significant growth rate owing to growing applications of scaffolds in orthopedic and dental fields. In terms of revenue, North America dominated the global bovine-based collagen for biomedical applications market in 2016, owing to presence of well-established collagen manufacturing facilities, usage of advanced extraction methodologies, increase in R&D activities, and introduction of several bovine collagen-based products such as bone graft substitutes, wound repair products, and novel drug delivery systems. The bovine-based collagen for biomedical applications market in Asia Pacific is anticipated to expand at the fastest CAGR during the forecast period. The market in the region is primarily driven by increase in geriatric population in India and China, rise in the number of trauma and burn cases, surge in awareness about bovine-based collagen products and biomedical benefits. Few companies offering bovine-based collagen products for biomedical applications have direct presence in Asia Pacific. Additionally, the market witnesses price variations of bovine-based collagen products in several Asia Pacific countries. For example, prices of these products in Australia and New Zealand is similar to those in the U.S., whereas prices of the bovine based collagen products for biomedical applications is quiet expensive in India as compared to the U.S. and Europe. 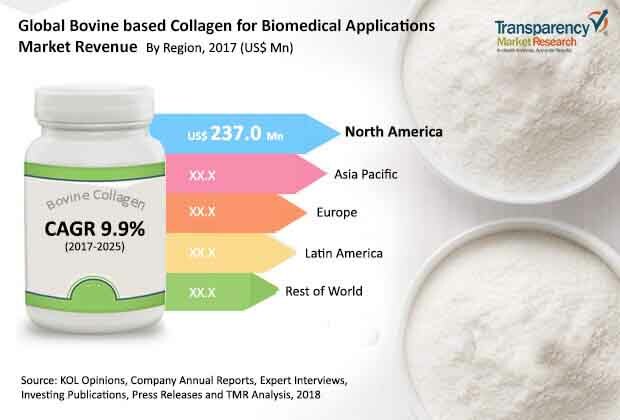 Increasing investments by pharmaceutical companies in emerging economies support the significant expansion of the collagen market in countries in Asia-Pacific and Latin America. The report also provides profiles of leading players operating in the global bovine-based collagen for biomedical applications market. Collagen Solutions LLP and Medtronic are the major players operating in the market, offering products with proprietary technologies. Other players include BBI Solutions, Symatese, Gurnet Point Capital, Viscofan BioEngineering (a part of Naturin Viscofan GmbH), botiss biomaterials GmbH, Taxus Cardium, KYERON, and Collagen Matrix, Inc. In July 2017, Gurnet Point Capital acquired Innocoll Holdings plc for US$ 209 Mn. Innocoll was a reputed medical grade collaged based products manufacturer. The collagen-based products predominantly was made from bovine and equine Achilles tendons. In May 2017, Viscofan BioEngineering established a production plant for manufacturing medical grade collagen product in Weinheim, Germany. The company applied proprietary technologies and extraction procedures to process collagen products made from bovine skin. The type I collagen product is available in several forms and thickness. Currently, the company is planning to manufacture a collagen based product that can be used in cardiology, urology, dermatology, and dentistry. In September 2015, Collagen Solutions acquired all assets and exclusive worldwide license from ChondroMimetic from Orthomimetics Limited and Cambridge Enterprise Ltd. ChondroMimetic is primarily a manufacturer of collagen-based implants utilized for the treatment of small osteochondral defects. This acquisition provided Collagen Solutions with official license to sell regenerative medical products in the orthobiologics market across the globe.